While most people think of acne as a problem for teenagers, adult acne is becoming just as common. One study revealed that this problem is on the rise, with over half of adults between the age of 20 and 40 experiencing acne breakouts. While women tend to develop acne more often as adults, post-adolescent acne is now becoming more prevalent in males than it was in the past. If you suffer from this problem, understanding what causes it can be the first step toward effective treatment and lowering the risk of developing future blemishes. Grabbing processed foods during hectic days at work and then drinking beer or eating pizza on the weekends may start to take a toll on your skin. Some studies show that adult acne in men can be triggered by a diet that is high in sugar, starches, and carbs. This is because starches turn into sugar once they are processed by the body, and high sugar levels have proven to be a factor in skin irritation and the formation of skin eruptions, such as pimples. To lower your risk of acne, include plenty of foods in your diet that are low in sugar and high in protein and antioxidants, such as leafy green vegetables, berries, and lean meats. Cut back on alcohol and drink more water, which keeps your skin moisturized and reduces excess oil production from the sebaceous glands. Psychological stress is known to affect the heart, mind, and emotions, but it can affect the skin as well. 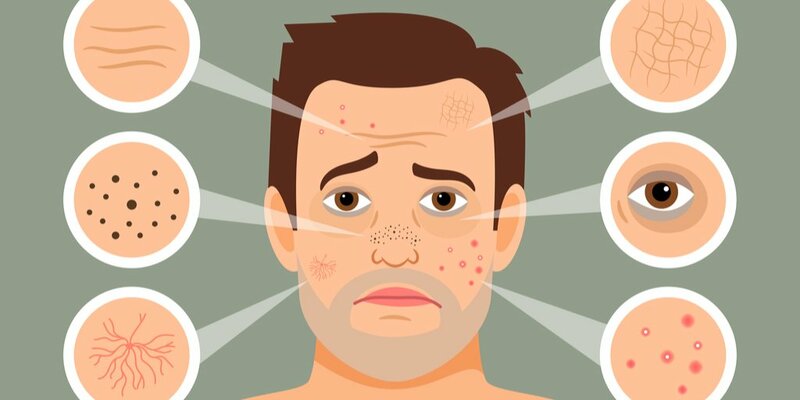 Stress is one of the main factors for adult acne in men, as hormones that affect oil production in the skin are released when you feel stress from work or as a result of personal or financial issues. These hormones cause the sebaceous glands in the skin to release large amounts of sebum, the natural oil that keeps skin moist. However, when too much sebum is produced, it can clog pores and lead to blackheads, whiteheads, and even larger, inflamed pimples. While daily stress can be difficult to avoid, exercise, meditation, or a fifteen-minute break in the late afternoon where you can enjoy silence and organize your thoughts may help you feel more relaxed. Try to avoid caffeinated drinks and tinker with gadgets like fidget cubes to reduce feelings of stress and anxiety that could trigger new acne breakouts. If you love to hit the tanning bed at your local salon or spend a lot of time outdoors and have noticed new acne outbreaks, ultraviolet light may be to blame. When unprotected skin is exposed to the sun, it can dry out and cause the sebaceous gland to produce more oil. The more that is created, the higher the risk that your pores will become clogged, which eventually causes acne breakouts. If you do not want to give up your time outdoors, protect your skin with a sunscreen with an SPF of 30 or higher. Look for an oil-free brand that will not clog your pores and is resistant to water and sweat, which can be especially important if you participate in outdoor sports. Avoid tanning beds, as spending too much time artificially darkening your skin can cause cancer. If you have nervous habits that include touching your face, then you might be increasing the chance of acne development. Bacteria on your fingers can be transferred to your face, where it can multiply on the skin’s surface and encourage acne growth. Oils from the skin can also be left behind that may contribute to clogged pores. To avoid this factor that is a cause of adult acne in men, keep your hands away from your face and do not pop or pick at any pimples that develop, as this may cause scarring and the spread of more bacteria. DNA and genetics can play a significant role in acne development. In fact, some experts in the field, such as Harry Stylli, who has researched and supported studies concerning genetics and its link to diseases like cancer, believe that some people are predisposed to certain illnesses and conditions because they are coded into their DNA at conception. As a result, if your father, mother, or a grandparent suffered from acne as an adult, you are likely at greater risk to as well. While you cannot change your genetics, there are a few steps you can take to lower your risk factors. For example, shop for hygiene products carefully and ensure that you buy only those that are labeled as non-comedogenic, which means they are designed to wash away easily instead of blocking your pores. Use razors made for sensitive skin, and talk to your dermatologist for tips on caring for your acne-prone skin. Having post-adolescent male acne can be frustrating and embarrassing. However, when you understand what causes it and what you can do to reduce breakouts, you may be able to manage your skin’s health and avoid pain and scarring.